My search for a camera that best fits my needs and which, in my opinion, provides an excellent set of engineering trade-offs, did not end in 2008. Technology moved on. Now we have CMOS sensors, wider aperture lenses and respectable electronic view finders. I find the typical LCD on the rear of the camera only useful for indoor photography. Outdoors, in sun or snow, the LCD is pretty much useless for composing a picture, for fast action shots, or reading and changing camera settings. CMOS sensors make rapid picture bursts possible and in general make a camera quicker. Their dynamic range, though, is not different from that of CCD sensors. Thus for increased dynamic range the sensor area must be larger, which leads to bulkier lenses and somewhat larger camera bodies. But for small sensors there are now new lenses with wider aperture not only at wide angles, but also at the telephoto end of the zoom range. This helps with low available light photography or allows for shorter exposure times to freeze movement. Any improvements in depth of field control from using wider apertures are only marginal due to the short focal lengths required for the small sensors. Panasonic's Lumix line of cameras has gone from LX2 to LX3, to LX5 and now LX7. 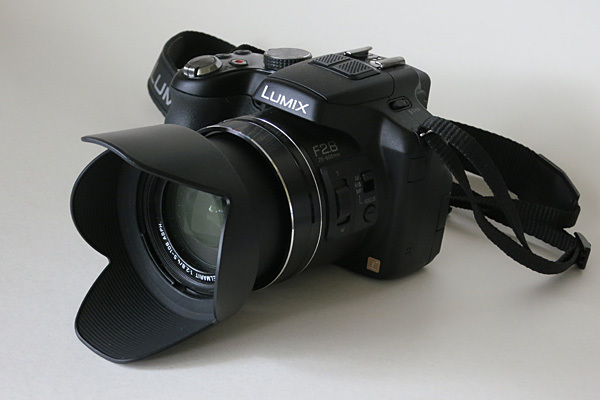 The latest model, above, is still of reasonably small size, but now has a MOS sensor, a 24-90 mm equivalent focal length lens with outstanding F1.4 to F2.3 opening. 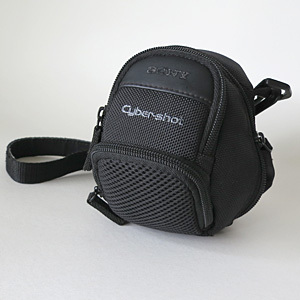 Most important to me is the hot-shoe which accepts the bright and fast electronic view finder EVF2. I usually work in aperture priority mode and so the aperture marked control ring around the lens barrel is very convenient. The size of the LX7 has increased slightly over earlier models. Image quality with the new lens, sensor and jpg processor are so good that I rarely use the raw mode. Multiple exposures for later HD processing are so fast that one can work without a tripod in most situations. I feel the review of the LX7 in DPReview does not do full justice to this capable camera. 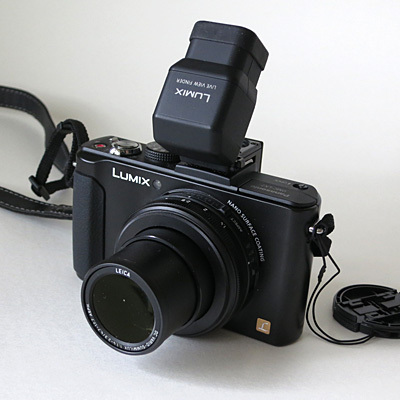 The LX7 with EVF and shoulder strap attached fits into a small Sony camcorder bag. I carry it around the waist. Camera with EVF attached also slip into a coat with large pockets. When walking I often carry the camera in front of my chest, ready to take pictures. The camera bag has room for a a spare battery, a micro-fibre cleaning cloth, extra SD card and a Voigtlaender 50 mm optical view finder with 1:1 picture size. I do not like to use a flash that is built into the camera, or to carry a bulky external flash with me. I prefer the naturalness of available light over the artificial effects of flash. Earlier I had bought a Canon S100 for its really small size and low light capability. It slips into any pocket and is unobtrusive. Though this is a very capable camera I use it rarely because I love the LX7/EVF2. 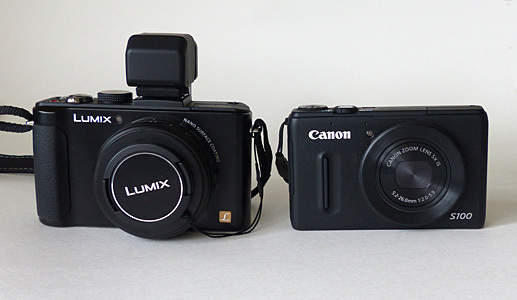 Picture quality is comparable between the two, but the LX7's user interface and handling are superior to the S100. 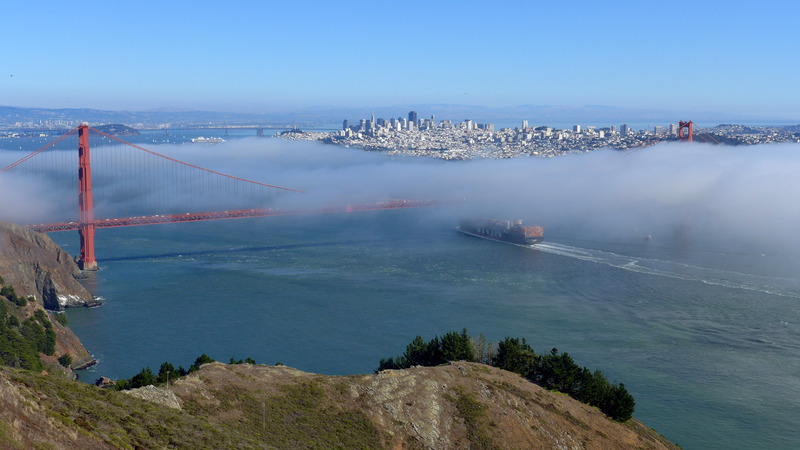 Americas Cup races were held last year in San Francisco Bay. As a longtime but now retired windsurfer I still have a fascination with high-tech, fast moving sailing crafts. 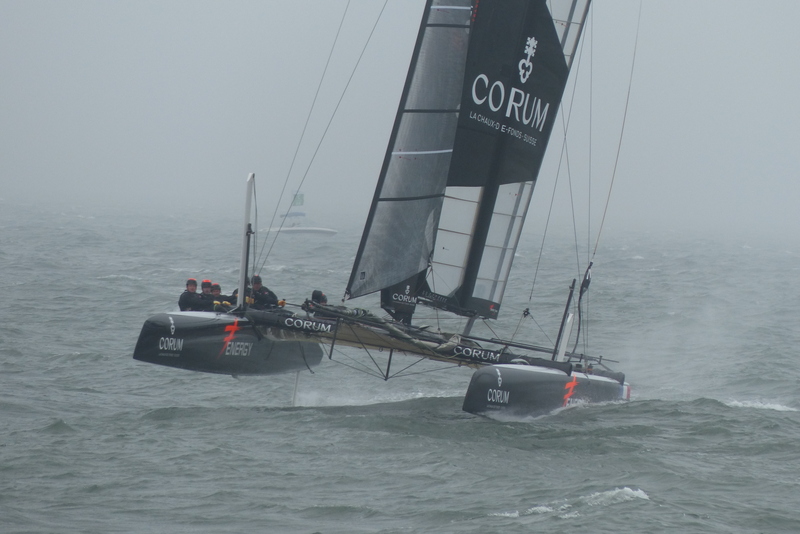 I watched the racing from shore and took pictures with my trusted FZ50, which has a 35-420 mm, F2.8-3.7 zoom lens. I soon found out that view finder and handling speed were not up to the task. 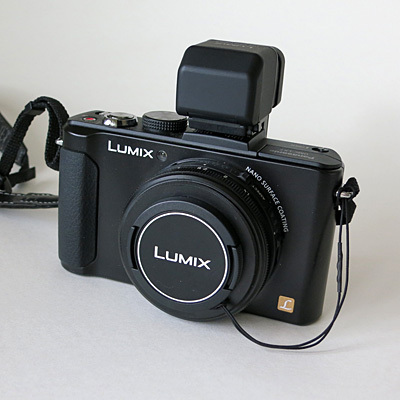 This was a convenient excuse to quickly buy the new Panasonic Lumix FZ200. It carries a 25-600 mm, F2.8 zoom lens and most importantly has a CMOS sensor for fast action shooting. The view finder is also much better than the FZ50's, but not quite on par with the EVF2. This camera is an amazing piece of technology. If size did not matter and I could only own a single compact camera, then I would chose the FZ200. It's well thought-out design fits an extremely wide range of applications and with ease. My search for the camera that best fits my needs has come to a conclusion and I want to spend more time to fully use what I have in my hands. As an engineer I have been fascinated to observe the trade-offs that camera designers make to optimally use available technology and which directions they are pushing. 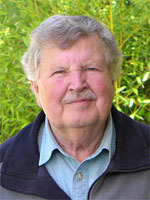 The trend now is for larger sensors in small camera bodies, but the lenses necessarily increase in size and become dimmer. The major gain is reduced depth of field for background blurring and increased low light sensitivity. The small sensors of the LX7 and FZ200 cannot compete, but their performance when shooting raw meets all my needs. I use Adobe Lightroom 4 for post-processing and printing, Google Picasa for sorting and general viewing.